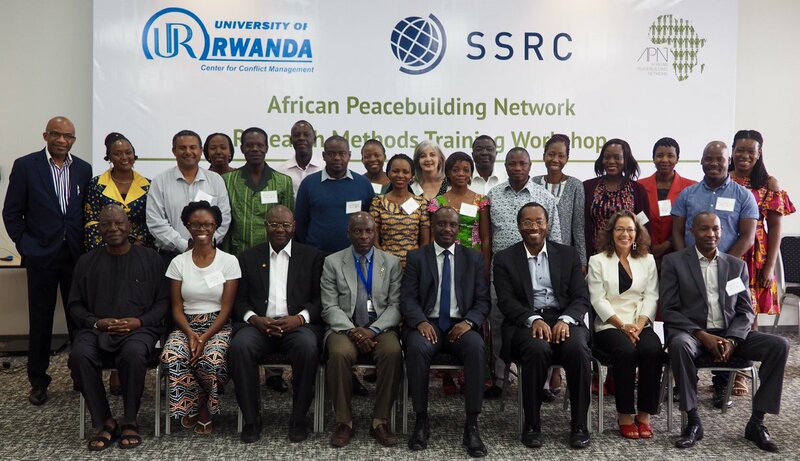 The African Peacebuilding Network (APN) held a three-day Research Methods Training Workshop for the 2018 cohort of APN Individual Research Grant recipients in Kigali, Rwanda on June 21-23. The workshop was organized in collaboration with the Center for Conflict Management at the University of Rwanda. The workshop combined lectures and interactive discussions with small working groups and one-on-one mentoring sessions led by experienced scholars, including APN Alumni, and current and former APN Advisory Board Members. Topics included research ethics in post-conflict contexts, quantitative and qualitative research methods, and gender mainstreaming. 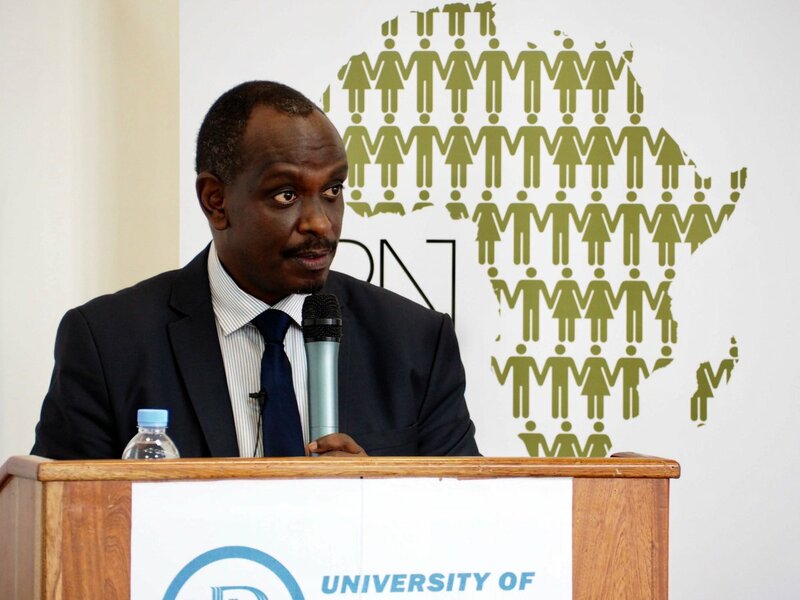 Prof. Francois Masabo, acting director of the Center for Conflict Management (CCM) at the University of Rwanda (UR), spoke to how the collaboration with the APN will allow CCM to strengthen its research capacity and as a consequence, its teaching capacity. Prof. Nelson Ijumba, Deputy Vice-Chancellor for Academic Affairs and Research, University of Rwanda welcomed the 2018 APN IRG awardees to Rwanda and commended the Social Science Research Council on its role in supporting social science research around the world. He emphasized the significance of the SSRC-UR partnership to Rwanda as a country and to UR as an institution. Prof. Ijumba also expressed the hope that participants would be able to learn something from Rwanda’s experience of post-conflict reconstruction. APN Program Director Cyril Obi addressed the 2018 cohort of APN grantees who, he noted, were chosen through a rigorous selection process. He described them as some of the best and brightest of Africa. Dr. Obi added that it was significant that the workshop was held in Rwanda, considering its unique experience with post-conflict reconstruction, reconciliation, and development. He also noted that despite its size, Rwanda “punches above its weight” with regard to peacebuilding in Africa. The first lecture was given by the esteemed Rwandan Senator, Richard Sezibera. Before becoming a lawmaker, Senator Sezibera served as Secretary General of a regional organization, the East African Community (EAC), Ambassador to the United States, and Minister for Health. His lecture titled "Peacebuilding in Rwanda: The Journey So Far" gave an overview of the unprecedented path that post-genocide Rwanda followed to achieve peace, stability, and increased prosperity. He underscored that Rwandan peacebuilding is based on a clear understanding of Rwandan history, and culture. Senator Sezibera pointed out that Rwanda has invested in political solutions to cement stability, and that it views effective and efficient public service delivery is a key building block for peacebuilding. Post-conflict peacebuilding, he added, is not only about reconstructing the state but also ensuring the inclusion of all groups such that electoral competition doesn’t exclude any group in Rwanda. APN Advisory Member Prof. Rita Abrahamsen, Director of the Centre for International Policy Studies (CIPS) at the University of Ottawa, spoke to grantees on “Conducting Fieldwork Research in Different African Contexts: “Do’s and Don’ts.” Prof. Abrahamsen warned grantees not to panic when their research doesn’t go according to plan, noting that research plans sometimes fall apart when there is a disconnect between one’s expectations and the reality on the ground. She explained that being adaptable and resourceful will help in dealing with unforeseen circumstances in the field. She urged grantees to have a fairly clear sense of direction going into the field to avoid being pulled in multiple directions and being distracted from their research objectives. Prof. Abrahamsen encouraged them to find out as much as possible about a particular context before they go there to carry out their research. She also suggested that grantees constantly reflect on their positionality (even where they think they are insiders), which may be one of power. By shaping interactions with their interlocutors, these dynamics could affect the research process and outcomes. Prof. Layi Erinosho, the President of the African Sociological Association (ASA), gave a lecture on “The Place of Quantitative Research Methods in Field-based Peacebuilding Research.” It was an in-depth discussion of survey methodology and its variants, highlighting the strengths and weaknesses of the different survey methods and their suitability for answering different kinds of research questions. In addition, Prof. Erinosho outlined how to develop data collection instruments for quantitative research that match the researcher’s objectives, as well as how to review and analyze the data once it has been collected. Prof. Erinosho also urged participants to supplement quantitative methods with qualitative methods, which are more suitable to answering certain questions. APN Advisory Board Member Prof. Kenneth Omeje gave a talk titled “Some Imperatives for Peacebuilding Research in Africa: A Critical Reflection on Qualitative Research Methods.” He told participants that though policy-makers favor research with quantitative precision, this does not necessarily restrict policy-relevant research to quantitative research. Prof. Omeje advised grantees to clearly define their research questions and objectives in order to determine the types of data their projects require. They should also be aware of the strengths and weaknesses of the methods of data collection and analysis they are using. As did Prof. Erinosho, Prof. Omeje advised grantees to consider how mixed methods can enrich their projects. He reviewed some of the major qualitative methods of fieldwork data collection applicable to peacebuilding research—interviews, observation, focus group discussions, and ethnographic methods—as well as common mistakes that qualitative researchers make, such as failing to understand the impact of cultural sensitivities for data collection, not budgeting for field assistants, overloading data collection instruments with too many questions, and failing to pilot test instruments. APN Associate Dr. Yolande Bouka, a postdoctoral fellow at the Josef Korbel School of International Studies, University of Denver, USA, delivered a lecture on “Mainstreaming Gender into Peacebuilding Research Methods.” She spoke to the conceptualization of “gender” and encouraged grantees to think about how they can incorporate gender as an analytical tool in their own research projects. Given that there are several United Nations and African Union policy frameworks on gender equality in peace and security, Dr. Bouka observed that it would be difficult to avoid any consideration of gender while doing peacebuilding research in Africa. Among her many key insights was the fact that “gender” isn’t only about women—noting that a gender lens also improves our understanding of the construction of masculinities. Dr. Bouka also spoke about “intersectionality,” a theory which posits that gender is one of many categorizations in an overlapping and interdependent system of discrimination and disadvantage. She challenged grantees to put in the extra effort to find women writing on their research topics, and to cite women authors and gender-sensitive studies. She also encouraged them to think about how gender plays into the dynamics of your research team and whether they could be more accommodating to the particular needs that some women might have. On June 22, as part of the outreach component of the program, APN staff, grantees, and workshop resource persons visited the Rwanda Governance Board (RGB), one of the key coordinating institutions for peacebuilding in Rwanda. RGB’s mission is to promote the principles of good governance and decentralization, monitor the practices of good governance in public and private institutions, and conduct research related to governance for achieving good service delivery, sustainable development, and prosperity. The APN delegation met with RGB deputy CEO Dr. Usta Kaitesi who spoke to the oversight functions of the RGB, and provided an extensive overview of the evolution and roles of Rwanda’s various post-genocide political institutions and how they connect with the country’s project of peacebuilding. For the final lecture of the 2018 APN Research Methods Workshop, APN Advisory Board Chair and Vassar College professor Ismail Rashid spoke on "The Ethics of Fieldwork-based Research in Different African Conflict-Affected Contexts: What Works Best, Why?” He observed that many of the grantees’ research projects will involve engagement with marginalized people who have been disproportionately affected by conflict. Prof. Rashid advised grantees to be aware of the power dynamics at play and ensure that research participants have the resources to push back and say no to them. He urged them to take advantage of the Institutional Review Boards (IRB) in their institutions/universities where possible, as doing so will help protect them and the communities they work in. Prof. Rashid also recommended that grantees be mindful of the influence of their "gatekeepers" in the field in order to maintain their objectivity. A key component of the APN Training Workshops is the small working group format. During the working group sessions, grantees gather into pre-assigned groups of two to four led by a resource person/mentor. During this time, they have the opportunity to receive feedback for their mentor as well as their peers. All the grantees and mentors will have reviewed all the research proposals in advance of the workshop in order to allow for maximal time for feedback and constructive critique and exchanges. The goal of these sessions is for grantees to strengthen their research designs and methodologies before going into the field. This year the APN introduced “clinics” to the workshop format, one for quantitative methods led by Prof. Layi Erinosho, and another for qualitative methods led by APN Advisory Board member Prof. Heidi Hudson. These were optional resources for grantees that requested further consultation on in-depth questions related to their methodology or research design. The APN also organized a series of excursions during the workshop, which allowed participants to learn more about the host city, Kigali. These included a visit to the new Kigali Conference Center which hosted the African Union Summit in March 2018, and a group networking dinner at a Rwandan restaurant, where participants enjoyed live traditional Rwandan music. The visit to the Rwanda Genocide Memorial, a permanent memorial for the victims of the 1994 Genocide, was somber, yet highly informative. It served as a testament to the importance of preventing conflict and building sustainable peace. It was also reminder of the progress that has been made by Rwanda since. Photos from this event can be viewed on the APN's Flickr page.